It's not as difficult as you think to cook the perfect turkey. 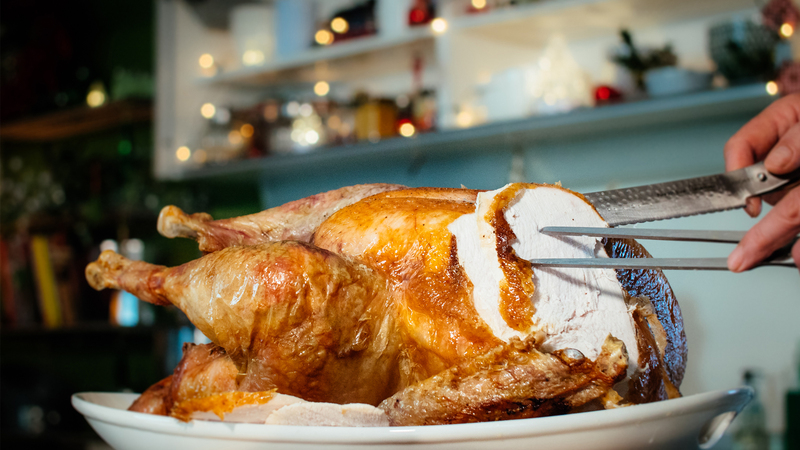 Kevin Dundon shares his Traditional Turkey recipe for the perfect Christmas dinner. 2. Rub some butter underneath the turkey breast skin by lifting it gently with your hands (make sure to wash your hands before this process!) and massage the butter onto the flesh. 3. Add the lemon, sage and garlic (if using) into the cavity of the bird. Tie the bird legs back neatly and don’t forget to weigh the turkey to work out the cooking time. Allocate 20 minutes per pound, plus an additional 20 to 30 minutes in the oven. In total, a 6.5kg, or 14¼lb, turkey should take about 4.30 - 5 hours to cook. 4. On a large roasting tray, lay the carrots and onions and place the turkey on top. Season well with salt and pepper and pop in the preheated oven. 6. After 20 minutes, drop the oven temperature to 160°C and cover loosely with some tin foil. Continue cooking until cooked through or reached the core temperature of 70°C or when a skewer is inserted into the leg meat nearest the bone, the juices should run completely clear. 7. Remove the tin foil for the last 20-30 minutes to allow a crispy skin! 8. Allow the turkey to rest for 15-20 minutes when it comes out of the oven, then carve as required!